A new breed of men’s watches has emerged, one with the style and sophistication to supersede all expectations. A dynamic mix of respected brands Bentley and Breitling, this new collection of luxury men’s watches captures a masculine elegance uniquely found in the center of where vehicle meets timepiece. This incredibly bold collection of timepieces came to be in honor of the 10th anniversary of the partnership between these two esteemed brands. In 2002, in the midst of designing the acclaimed Bentley Continental GT, the company invited luxury men’s watch brand Breitling to take part in the design of the dashboard clock and other elements. This would mark the first time the brand entrusted a watch company with such a significant task. This alone speaks volumes of the highly respected reputation Breitling holds among fans worldwide. Incorporating classic Bentley design elements like knurled bezels, this limited-edition collection of men’s watches encompasses the style elements that have made Bentley a pinnacle of luxury in the automobile industry. Honoring the anniversary of the partnership between two iconic brands, Breitling has released three new chronographs: the Bentley B06, the B05 Unitime and the B04 GMT, aptly named for the British car brand who has dominated the market with its impeccably designed vehicles. Available in steel and red gold, The Bentley B06 combines world-exclusive features like a variable techometer and “30-second chronograph”, ensuring an incredibly accurate time reading narrowed down to 1/8th of a second. Utilizing design elements found in Bentley vehicles, the sleek design of this watch allows for maximum style with superior functionality. The B05 Unitime timepiece contains a double-disc system for an increased readability of 24 time zones. A sculpted globe on a black or white matte dial lends a hint of delicate artistic style to this powerful piece of craftsmanship. Utilizing a functional dual time zone system, the B04 GMT pairs a high-power patented Breitling movement with a suave body to create a piece ideal for world-traveling businessman or simply those who appreciate class and sophistication embodied in a timepiece. These three models will be available for purchase at the brand’s London flagship store, recently opened in June. 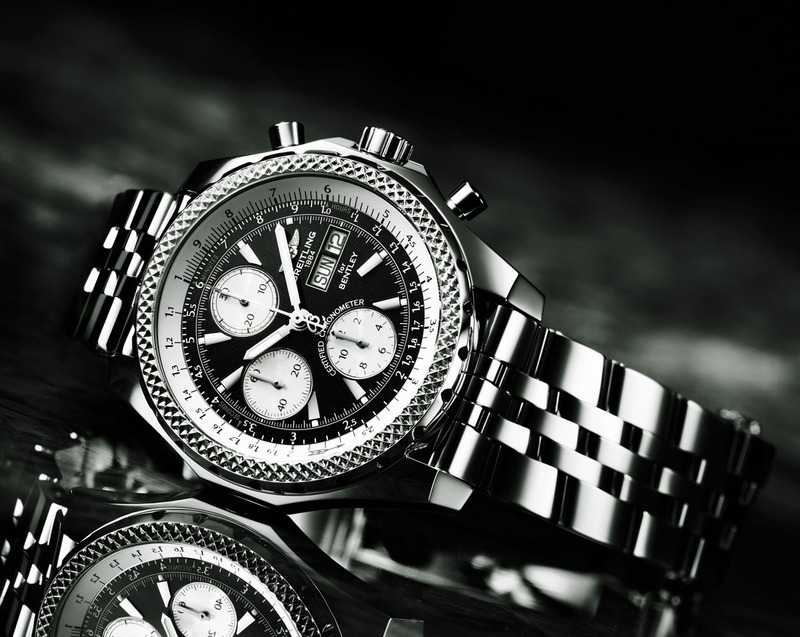 While Breitling for Bentley timepieces are undoubtedly a prized possession to those who own one, the high price point and limited availability makes these men’s watches simply unattainable for many. Though this stunning collection may very well be out of reach, Juno Jewelry boasts a wide variety of suave, elegant and sophisticated watches to choose from. Juno Jewelry holds a commitment to providing our customers a superior shopping experience in all aspects. With a variety of beautiful handcrafted pieces to fit all types of unique styles and budgets, Juno Jewelry strives to offer high-level customer service and an ongoing dedication to buyer satisfaction. When shopping for bridal jewelry, men’s watches or anything else, choose Juno Jewelry to share in your quest to find the perfect jewelry for you or a loved one.